Samantha Skunk was created by Professor of Business William Scott (ret.) at the University of New Hampshire. Scott was inspired to create Samantha as a “no smoking” symbol by his daughter who suffers from asthma. 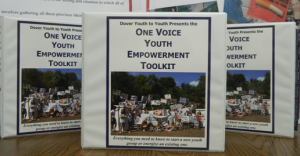 It was piloted by Dover Youth to Youth shortly after it was created and has been in regular use in Dover ever since. Samantha Skunk presentations bring student leaders/presenters to the classrooms as a lovable magenta skunk and as other characters in the story. 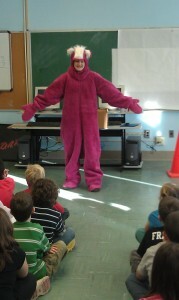 The story is presented by students using large puppets or in full costume. 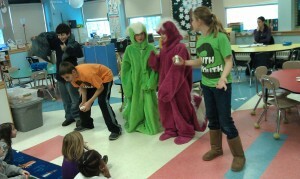 Youth to Youth students are trained in Dover to present the story. Total presentation time runs about 30-35 minutes depending upon the extent of questions and answers provided for at the conclusion of the presentation (recommended). 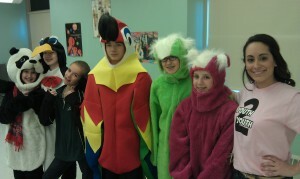 Our student presenters for Samantha Skunk are generally in middle school but we have used high school presenters as well. In the original tale of “Samantha Skunk: Why Smoking Stinks” a team of 5 students conveys the story of how Samantha tries smoking. After smoking, Samantha changes color from her “unique” magenta color to green. As the story progresses, Samantha turns back to her beautiful magenta color with the assistance of Solomon the fish (large puppet) and promises to “never smoke again – and spread the word to help others”. An audience participation element is added to the presentation when the student-narrators periodically ask the class: “What do we know about smoking?” To which half the class answers “Smoking stinks” and the other half replies “like camel’s breath!! !” The underlying strategy is one of social disapproval (smoking is yucky) as opposed to focusing on the cancer and health-related issues that are emphasized when students are older. In Dover, this presentation is provided to second grade students in individual classrooms or as assemblies. A third grade audience is probably the effective upper age range and first grade is our lower age of delivery although it has been used at kindergarten. In Dover, we have developed two additional presentations involving the Samantha Skunk characters. Intended for ages 4-7. We deliver it in kindergarten in Dover. In this story Samantha has tried medicine that wasn’t hers and it has caused her to turn green. The characters, style, tone and interactive elements are all consistent with the original story. Solomon the fish helps her understand the core learning points and leads her to return to her original color. Core learning points are: someone else’s medicine might be bad for you, never give yourself medicine, if you find medicine – tell an adult. Intended for ages 6-9. We deliver it in Dover in 2nd grade as an assembly. In this version Samantha has tried smoking and she can no longer run as fast or keep up with her friends (the Panda and Penguin). She has turned green and stayed that way until her friends and the magic parrot help her understand how smoking anything can hurt her lungs and her ability to get Os (oxygen) to her muscles. For More Information on how to orderTo request a presentation of any of the Samantha Skunk stories by Dover Youth to Youth go to How to Schedule Us in the Resources section of this web site. For More information on Samantha Skunk or to purchase the program, please go to www.SamanthaSkunk.com. For questions about materials needed to set up your own Samantha Skunk program in your community, contact Dana Mitchell at 603.516.3274 or d.mitchell@dover.nh.gov.